Mud and ruts are seen on East Waldo Road in Waldo Thursday. 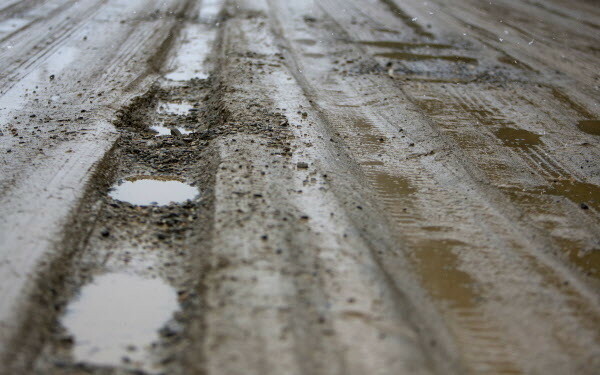 Waldo residents that live along the East Waldo Road admit it can be hard to travel in mud season. Living along the road, they said, is something that can bring neighbors together. "We all talk about the road," Deb Burwell said. 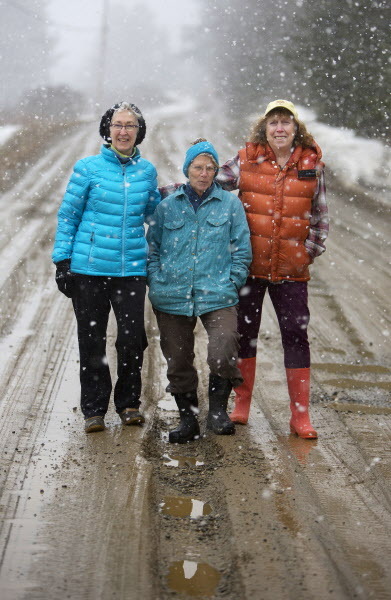 Deb Burwell (from left), Jennifer Pierce, and Annette Hanser stand in the middle of East Waldo Road in Waldo Thursday. The Waldo residents all live along the East Waldo Road, which can be hard to travel in mud season. Living along the road, they said, is something that can bring neighbors together. "We all talk about the road," Burwell said. 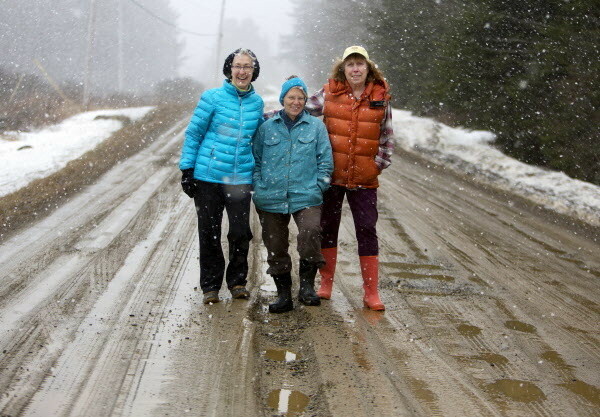 Deb Burwell (from left), Jennifer Pierce and Annette Hanser stand in the middle of East Waldo Road in Waldo Thursday. 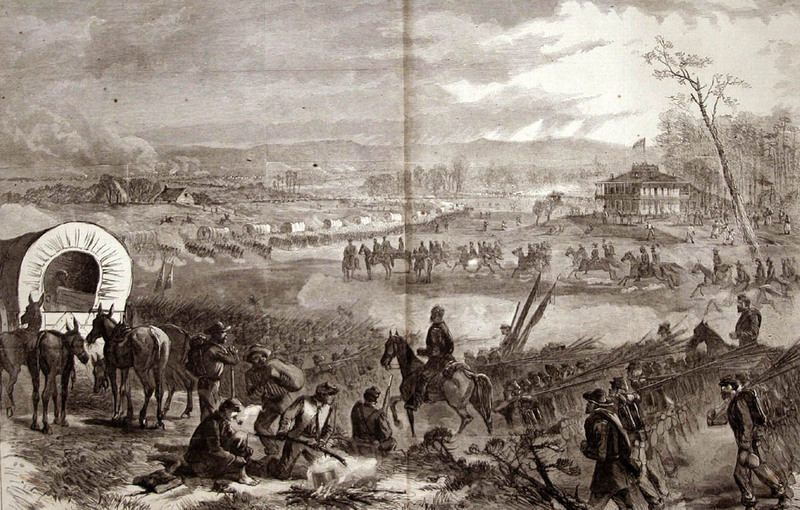 The Waldo residents all live along the East Waldo Road, which can be hard to travel in mud season. Living along the road, they said, is something that can bring neighbors together. "We all talk about the road," Burwell said. Even as the thermometer plunges toward zero degrees Fahrenheit around the state, the time of year Mainers love to hate — mud season — already has made a brief and messy appearance. You could say that mud is part of our regional identity. Florida has its palm trees and hurricanes, California boasts Hollywood and earthquakes, while Maine has a rockbound coastline and immense pine forests — and mud season. The messiest time of year has inspired songs, jokes and stories, as well as the old adage that Maine only has two seasons: winter and mud. Mud season typically strikes in mid-to-late March and lasts through at least April, but this year some parts of the state were mired in it before February even came to a close. The cold weather’s predicted return this weekend could even mean parts of the state will get a double dose. But as the snowpack melts and the frozen, solid ground gives way to a thick, oozing and unstable layer of earth, Deb Burwell of Waldo will be ready. Some years, the mud has been so bad that her gravel road is actually impassable, and Burwell will park at a neighbor’s house and walk the rest of the way home. Often, the road attracts people in pickup trucks who want to go mudding, which she said is aggravating because the aggressive driving “wrecks the road and makes a mess.” And, Burwell said, she used to be in a writing group, but come early spring, the other writers balked at meeting at her place. Still, there are some upsides to the sloppiest of seasons, Burwell said. It means the onset of spring in a water-rich state. And that’s not a bad thing. This year, the feeling is no different, even though the calendar is. It has been an unusually warm winter — especially the month of January — according to the National Weather Service, including three record-high temperatures recorded in Bangor in February. So mud season arrived earlier than it used to. Mainers should get used to that, according to one scientist. 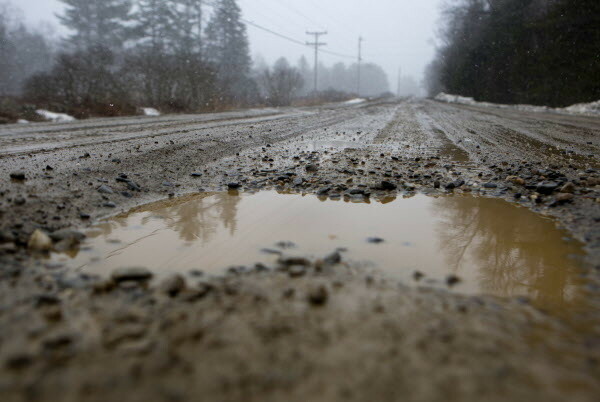 Mud season can play an important role in the state, he said, especially as Maine is still recovering from the 2016 drought. The most recent map from the National Drought Mitigation Center shows that a wide swath of the state is still abnormally dry, and the southernmost portion of Maine is still in either moderate or severe drought. Keith Kanoti, the forest manager at the University of Maine School of Forest Resources, said that mud season really ends when the leaves come out. He’s used to taking a break from logging when the woods are too wet to work in them. Right now, it’s hard to predict how this year’s will progress. Colder weather is predicted to return at the end of this week, he said, but the monthly weather outlooks from the National Weather Service’s Climate Prediction Center suggest that there’s an above-average chance of it being warmer than usual in Maine. Mud season can affect how we drive and where we drive. It can slow down construction project schedules. And it can even inspire careers, according to Belfast-based Thomas Fowler, who became a civil engineer after growing up in Millinocket watching the melting ice change the landscape around him. “It’s a fun time of year if you’re a kid playing in an icy driveway,” he said. 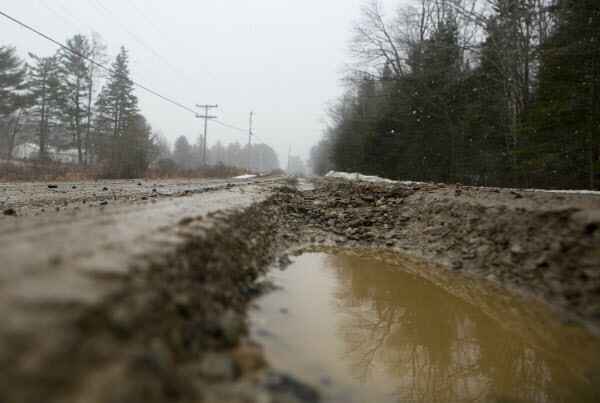 And for Mainers such as Burwell, mud season is an integral part of living on a rural, unpaved road.